expressed without speech; especially because words would be inappropriate or inadequate; not made explicit; not formally articulated or stated; implicit or understood; tacit. understood or implied without being stated; indicated by necessary connotation though not expressed directly; expressed or carried on without words or speech; implied or indicated (as by an act or by silence) but not actually expressed; done or made in silence; implied, but not expressed; silent. Not derived from formal principles of reasoning; based on induction rather than deduction. Implied indirectly, without being directly expressed. Capable of being understood from something else though unexpressed. Contained in the essential nature of something but not openly shown. Involved in the nature or essence of something though not revealed, expressed, or developed. Volonté implicite: celle qui se manifeste moins par des paroles que par certains actes ou faits habituels. Qui, sans être exprimé en termes formels, résulte naturellement, par déduction et conséquence, de ce qui est formellement exprimé. c. 1225, from Old French; from Latin : contemplationem = "act of looking at," from contemplari "to gaze attentively, observe," origin : "to mark out a space for observation" (as an augur does). The act of the mind in considering with attention; continued attention of the mind to a particular subject; meditation; musing; study; the act of regarding steadily. This is not a proper label, it's a "working title", a simple descriptor of the object studied. Contemporary : means concerning filmmakers still working in this field today. Cinema : the particular field of cinema intentionally self-limited by the 2 preceding adjectives. This blog is obviously biased. There is no intent to cover the entirety of filmic forms, or historical timeline. Whether this limitation, temporal and formal, is arbitrary or pertinent, it is meant regardless as a defining characteristic of this blog. Please understand and respect this clear self-imposed constraint. The films and auteurs included in this trend are underexposed and understudied, so this blog will not waste time and space covering other subjects and outside films, which have been, or still are, amply discussed and studied elsewhere. This is not the only prism through which these films can be looked at (these films may eventually belong to other trends/aesthetic movements for other aspects of their content/mise en scène), and maybe it is not the most enlightening perspective to study them, but this is what has been defined for this blog for the time being, and this is the specific aspect of these films that will be considered on this blog. Bruno Dumont, Lucrecia Martel, Ulrich Seidl, and Hong Sangsoo should be included, no? Thanks for putting the graph together, Harry - it's very useful to have a timeline like this, even if it does serve to throw up as many questions about inclusions as answers! would you care to explain why, maybe? I don't understand your confrontational/contemplation dichotomy... why should they be mutually exclusive? Being explicitly "violent" doesn't mean that the plot and images explicit the causality of these assassinations, like a conventional narrative would. Garrel's style, a minimalist form of Nouvelle Vague, is a formal stage preceding the emergence of CCC. La Cicatrice Intérieure is intellectual/conceptual staging. I agree - confrontation and contemplation shouldn't be mutually exclusive as a rule, but here I think they are... Elephant is a purely visceral (and eviscerating) film - its purpose is to show rather than suggest, confront rather than imply. I'd suggest that Clarke isn't concerned with traditional "causality" because we are fully aware of the motivation behind these killings, and it's their very randomnness and senselessness that makes them so disturbing... The "elephant in the room" is tackled head-on, the point being to make explicit what was previously tacit... His technique is also geared more towards the visceral and physical impact of the acts rather than a (simulataneous) contemplation of them... That's just my interpretation, anyway! If your definitions are criteria, the work of Dumont (everything), Martel (everything), Seidl ("Dog Days", "Jesus, You Know", "Import/Export", if not also the earlier nonfiction films), and, despite the volume of dialogue, Hong (everything) obviously fulfill them no less than the films and directors you've already selected. you confuse content and form. It's the observation that is calm, contemplative and understated, not the subject observed. The reason the observer is removed from the action is precisely because the narrative didn't introduce us to the protagonists (killer or victim), there is no melodramatic exposition to set up an emotional empathy. The mise en scene is intenationaly cold/neutral in opposition to the horror we see. As for Siedl, I only saw Import/Export. It is "contemplative" in a broad sense, but even with the discontinuous "plotline", each scene is still staged with dramatic dynamics. 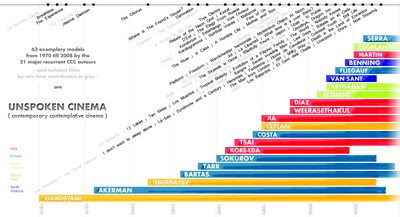 In this graph I only show the films that are unequivocally CCC, because too many people get confused otherwise. who said the CCC camera couldn't be dynamic? As for direct and unforgiving I don't see the connection with CCC. Compare the mise en scène of Akerman's D'Est or De l'Autre Coté, Gallo's The Brown Bunny, Bartas' Seven Invisible Men, Wang Bing's West of the Tracks, Van Sant's Last Days, Reygadas' Batalla en el Cielo, Tarr's Satantango / Werckmeister's Harmoniaks... you'll see a deliberate tracking shot (or following over-the-shoulder shot) is not the antithetis of contemplative. This is not a disqualifier for CCC, as far as I'm concerned. Now compare Elephant with other narrative films about clod blooded assassinations, IRA, action films and you'll see the camerawork (1 take) and the mise en scène (1 sided, detached, decontextualized, no expository set up) is quite different. yeah sorry, my mistake. For some strange reason I mismatched them in my mind, for they have the same profile to me. Both made early films that are contemplative in a broad sense (L'Emploi du Temps, L'Humanité, Flandres), but moved on to make more conventional dramatic/narrative films. Did you see Hadewijch already? I give you that it's some kind of a conceptual dispositif (contraption), but no less than Akerman's D'Est (who films waiting lines on the sidewalk of Russian streets, from her car window), Benning's 13 Lakes or Geyrhalter's Our Daily Bread. As you see I didn't use Clarke as a figurehead, it's just that film, and it's greyed out, because it's marginal and exceptional. I didn't list Van Sant's Elephant, because it's way more narrative and speechy than Clarke's, even if it's relatively quiet compared to mainstream cinema. Usually, if there is a formal concept at the basis of the film, meant to generate a form of "narrative", I disregard it as CCC. That's why this time I didn't include Matthew Barney, Roy Andersson... because if the dialogue is understated, the visible structure of the shots however imposes a mental discourse and an intellectual "pitch". But in this case, however strong is the structure, it's not the form that influences the observer, it's only the content (and again, you single it out because it's violence, not because it's narrative). The title of the film, and the extra-diegetic information about the events suggested (not re-enacted in a historical fashion) in the film offer the narrative that you add to the images. But the images themselves never identify the persons, purpose and intent. It could be a contemplative documentary on killer whales, we wouldn't get any more narrative clues. What is wrong with "showing everything"? CCC doesn't equate to maximum ellipsis and jump cuts to "avoid" showing the climax of the action. Usually that's what happens, because they focus on the down times, rather than the significant moments. But here, it doesn't bother me that the tracking shot goes all the way to the death. What matters most is that we don't see before and after this shot/shot, and that there is no attempt to narratively link all the shots with clues or continuity montage (which is the trademark of mainstream narrative cinema). Look at the tracking shot in Werkmeister Harmoniaks (a film that is speechy actually, but not in a way to drive the continuity of sequences or to help us understand the film as a whole) when the mob rushes to destroy the hospital. If we compare with another relatively "minimalist" films like Last Life in the Universe or Invisible Waves : it is about a mafia killer, who kills or gets killed after a hunt. And we can see the plot uses oversignificant devices like flashback or parallel editing to qualify images, to add meaning to the other sequences, to inform what was missing in the preceding/following shots. That stuff is not CCC. Anyway, it's good to work this stuff out! Why any documentary, contemplative or not, would not follow a killer whale hunting until she snaps a penguin or a seal... 10 times in a row? The CCC camera observes behavioural patterns rather than a dramatized plot. "an immense political significance and (unavoidable) contextual resonance"
You can't say that this is explicit in any way as Clarke films it. Like I said in my text above, you can give a political interpretation, analyze the subtext in a conventional movie review, because these films are not EXCLUSIVELY contemplative, they exist for other reasons too, they have other things to say than being contemplative. But none of this alters/dilutes/diminish their fundamental CCC nature, in their making, in their viewing experience. At least for this film it doesn't. Other films are more conventional/mainstream than CCC, that's why I put these aside. Elephant is a pure model as far as I'm concerned. "You can't say that this is explicit in any way as Clarke films it." When you suggested a killer whale doc, for some bizarre reason I pictured something like that recent penguin movie which Herzog takes a swipe at in Encounters at the End of the World! Could we at least agree on the meaning of the words explicit and implicit? Do you realise that the phrase "Elephant in the room" is a metaphor for something implicit? What is "explicit representation" in cinema to you? We know what it represents, we know what events it refers to, because of the title, because of the literature around the film, because of the history of the film. But not through the images alone. You know all that about the story because you are a British citizen aware of the real world context of this film. But the film itself doesn't say it. Imagine what would think a Japanese or Chilean viewer watching these images. These images don't say in which town it takes place. Is it in Northern Ireland, Ireland or Great Britain? Is it always in the same town, or in an different place everytime? It doesn't say who kills who. Is it the Irish shooting on the British, or vice versa? Is it IRA internal purge, or is it back and forth retaliations alternated by one camp then the other? These images don't say who are the victims, why they are killed. Are they guilty of murder or treason? Or is it because they refused to pay the blackmail tax? Are they based on real people or just random fictitious killing scenes? All this is required to make the political interpretation/assumption explicit. I also don't think I've acquired any exclusive knowledge by being a British citizen. For one thing, when the sectarian killings were taking place (in another country), I was far too young to comprehend them, and no doubt was more interested in, say, Lego than politics at the time! It's not because a film is shot on location that this place becomes explicitly identified on screen. Could you tell me in which area have been shot Raya Martin's films? Besides, Indio Nacional has intertitles to explain the political events that are not entirely explicit in the images. It's not the same level of minimalism (lack of information). Well, if we can't agree that implicit and explicit are not the same thing, and that it's not a matter of point of view, I don't see how we could discuss the concept of "contemplative cinema" which is far more subtle and ambiguous than the clear cut antagonism between "explicit" and "implicit". Oh, I'm sure we can agree that this is a matter of point of view! Congrats for this wonderful site! It was so revealing for me. I wanna ask you for a tab which does'nt exist yet, with the historical film titles, year by year, from Lumiere brothers till now. Did you quit it for any reason? May I find it anywhere?